The mantra for this year is 'Open Minds to Open Action' which will be interesting to unpack in different ways during the event, which has 3 different streams for the sessions which focus on how knowledge informs change, how tools enable change and how society effects change. The area that we will be exploring in our Open Education Smörgåsbord session will be looking at how to break down barriers to learning and we will try to give you a taste of the many facets of open education. There will be different aspects to concentrate on including changing teaching practice, shifting policy, releasing data and the sharing of resources. Led by the Open Knowledge Open Education Working Group, we have planned for it to be an interactive and collaborative session which will challenge people to think about what the future of education could be and how open data particularly fits into this picture. So the workshop will be running on Wednesday, July 16 from 14:00 – 16:00. 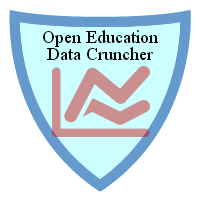 We also have a session etherpad so please do take a look, add your name if you’d like to be involved and add your own input to it, so we can help people discover and share a really wide range of ideas about open education, open data and open practices in education. We have 5 tables planned which will allow participants to freely explore some different areas in two 55 minute sessions. My table / space will be set up to give people an introduction and overview of a few distinct areas that I see surfacing in work and discussions around open education and open data. AREA 1 - USING DATA IN EDUCATION: Looking at how we can use open data to enrich teaching and learning, and to learn about data and data analysis within education or lessons. AREA 2 - METADATA and OPEN EDUCATION RESOURCES: Looking at how metadata and open data can support education, for example through the use of OER's in universities and schools and the role of initiatives such as the learning resource metadata initiative (LRMI). AREA 3 - GOVERNMENT DATA for EDUCATION: Looking at some of the ways that different governments are making contributions with open data to improve education in Brasil, Holland and New Zealand and the UK as well. AREA 4 - LEVERAGING OPEN BADGES IN EDUCATION: Looking and learning about how open badges (which leverage different kinds of metadata ) themselves can be used to support and extend formal education, and personalise it in different ways. AREA 5 - MOBILE LEARNING with OPEN DATA: Looking at how free, open source (FOSS) app authoring tools can be used to build apps that use open datasets with all kinds of applications. These range from improving the effectiveness of early grade assessments in Ghana, to building informal learning journeys in Singapore to how open government datasets are used to create more straightforward apps that inform parents about schools in their local areas. Also this section will look at some prototypes and templates being developed to help people to learn how to make, design and develop apps for mobile devices. There will be a few other surprises to add to this, including the fact that we will be bringing along food from our home countries like a real Smörgåsbord should! We won't be delivering a presentation, but want people to come and join in and bounce off some of the ideas on each table and get to drive forward into the areas they want to. So there will certainly be more than one way that participants could choose to engage in the session as there are 5 seperate offerings (of which mine is only one) which will be geared to be participant / interest led, with opportunities to share in groups and surface collective thinking together. If you are attending OKFest then we would love to invite you to come and join us! However, if you are interested to access some of what I will be doing but cannot make it, I will place links to all of my materials here afterwards.